On Wednesday Morning at around 10 AM a Private Plane of Air Blue Crashed near Pakistani Capital Islamabad in Margalla Hills and all 152 Passengers in the Plane died on the spot. The Plane was coming to Islamabad from Karachi and it was flew from Karachi at 8 AM. The Air Blue ABQ-202 came to Karachi From Turkey 9 hours ago. 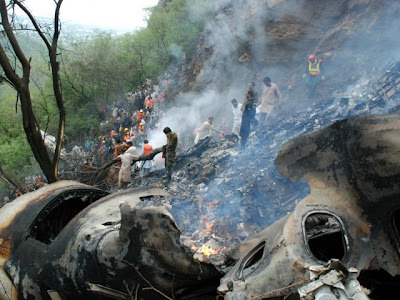 Interior Minister Rehman Malik has said that there is no Survivor in the Air Blue Plane Crash and we trying to recover the Dead Bodies from the Spot. There where 152 People on the Plane among which 6 where Crew Members while 146 where Passengers. The Black Box of the Plane has also been recovered from the spot. The reason of the Crash has not been found out yet however some Experts are saying that High Rain and Rog around Islamabad can be the reason of this Crash.